It was about a week ago that we decided to take Newton in to the vet because of his increasing meowing, apparent trouble sleeping, and starting to pee in more and more places. While I thought we might do some blood tests and see what was up, I also realized there was a good chance that we would just decide that that was it for him (as it turned out to be). I made the appointment for Sunday because our vet was booked on Saturday and I had another appointment on Friday. We actually had quite a busy week, and I admit that some of it was wanting to be distracted so I didn’t sit around moping about the impending vet appointment. I felt a little guilty that I didn’t want to spend as much time as possible with him, but honestly he was becoming an increasingly grouchy kitty and he really did not interact a lot anymore. Last Sunday – before I made the appointment – we had gone to the birthday party of our friends’ four-year-old twins, and while there Debbi scheduled a couple of other dates with their parents and some other friends. So Wednesday we met four of them at Flea Street Cafe, in a part of Menlo Park we’d never been to, for dinner and drinks. It’s a pretty good place, rather on the pricy side, and a little ritzy for our usual dinner haunts, but we might go back with other folks sometime. Friday I had an appointment to take my car in. I drive a 2000 Honda Civic, which I actually bought in fall of 1999, and it is starting to show its age. The battery needs to be replaced (it’s been replaced at least once before), I have an oil leak (which might be at the head gasket), and apparently a power steering rack leak as well. They told me to take the car to have its engine block steam cleaned (I’ve never heard of such a thing!) and I’ll bring it back this coming Friday to see if they can pinpoint the oil leak. But likely it will run well over a thousand dollars to get it all fixed. I will likely fix it, since I’m not yet ready to get a new car, but it looks like I’ll need to move on cleaning out the garage before too long so I can consider getting a new car (which I won’t want to park in the driveway). Friday night we got together with Susan and Subrata for dinner and games, which is always fun. In addition to the BBQ I made mai tais using the recipe the twins’ Mom uses (more or less), which is pretty different from the “traditional” mai tai (it uses pineapple juice) I made a batch, gave it a try, added some stuff to it, and it turned out pretty good. There’s still something missing, but I’m not sure what. It was also stronger than I’d expected, but I think the dark rum I happen to have on hand is pretty strong in both flavor and alcohol content. 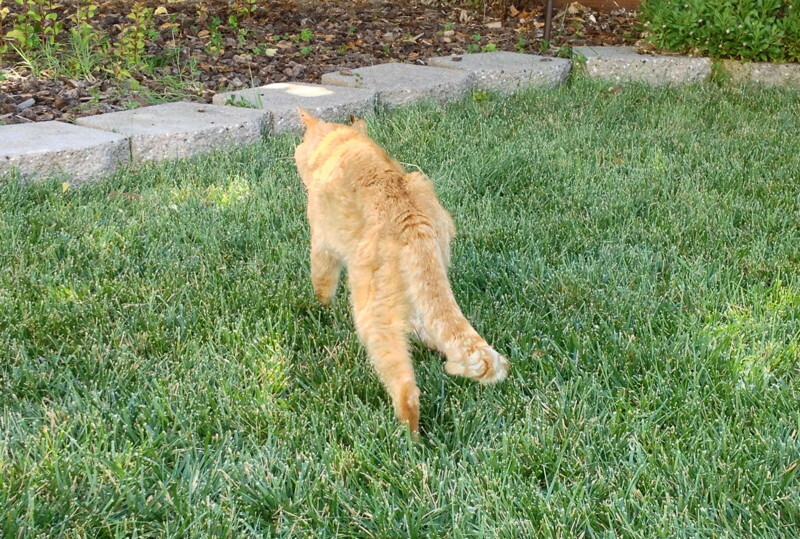 When the first people showed up, I let Newton outside with us, and basically just let him roam around the yard – as long as he didn’t go under the deck we let him be. 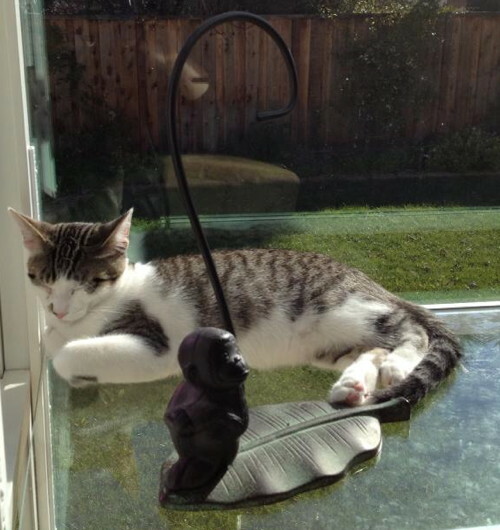 He lay in the sun, lay in the shade, went behind bushes and our Japanese maple tree, sat on the edging stones, and generally had a great time (meowing a lot of the time, too). Eventually more people showed up, so I took him indoors, but he spent at least an hour and a half (including some time before the party) in the back yard, so it was a good last full day for him. He managed to sneak outside a couple of times later, too. The party went rather longer than we had originally planned, but everyone was having fun and the kids were still full of energy so we didn’t worry about it. Things wound down around 8. This was good because we actually had plans with the neighbors around 8 to go hang out for the evening. So we were a bit late to that as we cleaned up (and gave Newton his subcutaneous fluids). It was a nice change from the busy-ness of the afternoon, though: Our neighbor enjoys making vodka drinks, so he prepared four different ones for us, and we all sat and talked and noshed on munchies and enjoyed the drinks, which were delicious. Now I’m feeling inspired to make martinis and such. We stayed until nearly midnight, and then staggered home, being very glad we didn’t have to drive. Debbi unfortunately felt sicker on Sunday (and is home from work today), which was also a drag because she was trying to take care of herself while we took Newton to the vet and then came home after having him put to sleep. It’s been easier getting over Newton’s passing than it was for me with Jefferson. Partly I think because I said goodbyes to him last year before his hospital stay, and partly because we’ve basically known since that stay that his day was not far off. Really he lived longer than we expected, I think. The kittens have been sniffing around his spot on the couch and sometimes lying there, and I sat there last night to watch the Red Sox game. Roulette I think knew something was wrong with him before he passed; we’re worried about how she’ll handle the fact that the last of the three cats she grew up with is gone, and now she just has these kittens that she doesn’t fully accept. With time, maybe she will. 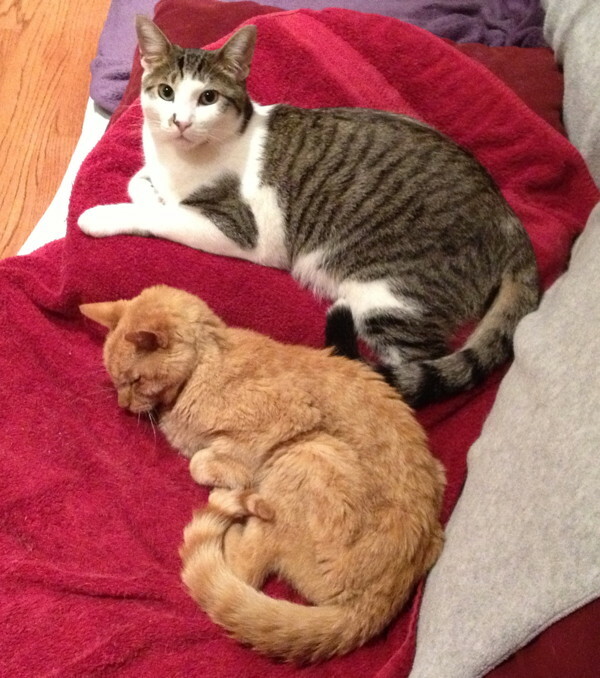 We’ve been picking up some of the things we had to deal with Newton peeing around the house, and we took up the towel from his spot and put a regular blanket there (our couch is covered in blankets to try to control some of the cat hair). It’s not quite the same and taking away the food dishes when Jefferson passed, but there’s a mark of finality to it. Disposing of his remaining medications is next, I guess. And I can try to return that unopened pack of puppy pads to Petco. Today Newton went to join his brothers Jefferson and Blackjack in that big cat window in the sky. Newton lived to be 19 years old, quite elderly for a housecat, but I think he was mostly happy up until the end. I got Newton and Jefferson not long after I left grad school in 1994. The Humane Society in Madison thought they were six months old in October, but after seeing how big our current kittens were at six months, my guess is they were more like three or four months old when I got them. Newton was “the explorer” of the pair. I remember when we (my then-girlfriend Colleen and I) let them out of the carrier when we brought them home, they both immediately did a 180° turn and walked right up to a half-height mirror that was leaning against the wall. 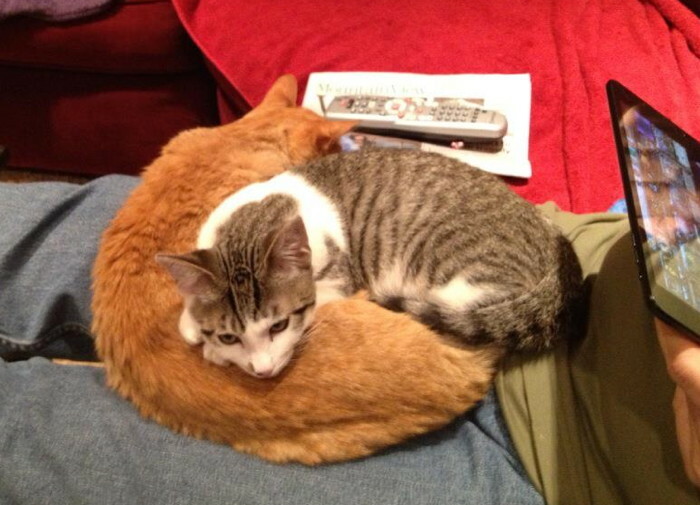 They both jumped back from the “other cats”, but quickly learned that there were no actual other cats. They spent half an hour exploring the living room, and then walked over towards the kitchen. Jefferson headed into the kitchen, but Newton noticed the hallway leading to the bedroom and bathroom and immediately turned and headed into the bedroom, with Jefferson following. I also remember going into the bedroom when they got bigger and finding Newton on top off the door. I guess he jumped onto the desk, onto the bookcase next to it, and then across the doorway to the top of the door, where he happily sat for who knows how long before I recused him. Newton was also a very enthusiastic, high-energy kitty. I remember we would play with them and he would keep going long after Jefferson called it quits. Heck, he would keep going until we stopped, and would sit looking at the toy and panting. And if we started again, he’d keep going. We finally stopped for good because I was afraid he was going to hurt himself! Jefferson grew to be much bigger than Newton, and also became top cat, as I’d learn later. Newton topped out at a little under 10 pounds; I always wondered if he’d been the runt of his litter. Despite their size difference, Newton and Jefferson were pretty evenly matched. 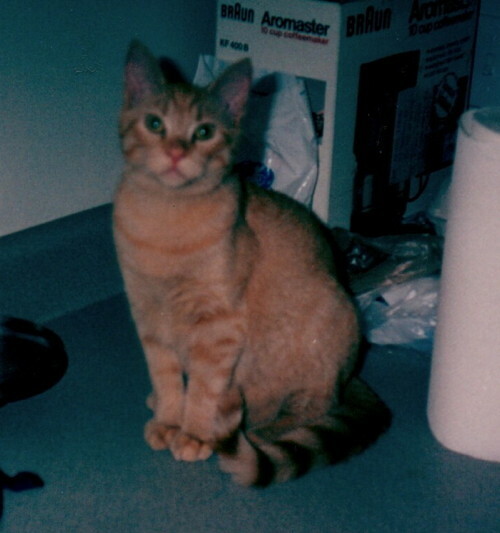 Newton was also the social one: I remember hosting a book discussion group at my apartment, and Jefferson stayed in the bedroom, but Newton eventually came out, jumped up on an empty chair, and loafed up as if he were listening to the conversation. The three of us moved to California when I went to work at Apple. I started dating Debbi, and bought my townhouse in Mountain View. Jefferson may have resented Debbi’s taking my attention away from him, but Newton adjusted pretty well; he enjoyed getting attention from anyone, and got more and more snuggly as he got older. 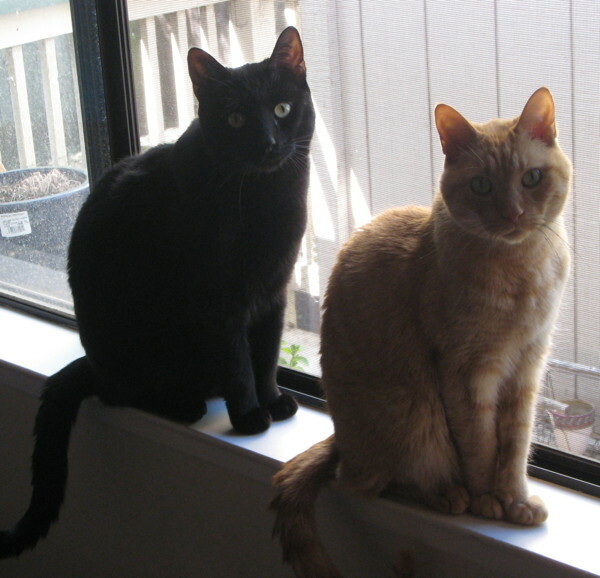 Debbi’s kittens came along in 2003 and changed the dynamic: Jefferson became top cat (though Newton could always pester him like no one else could), and Newton and Blackjack started their struggle for the second position, which I don’t think ever really got resolved. The two of them would sometimes wrestle with each other, and we’d call them “the silent wrestlers” because they would often fight without making a sound, just pouncing back and forth and circling each other. 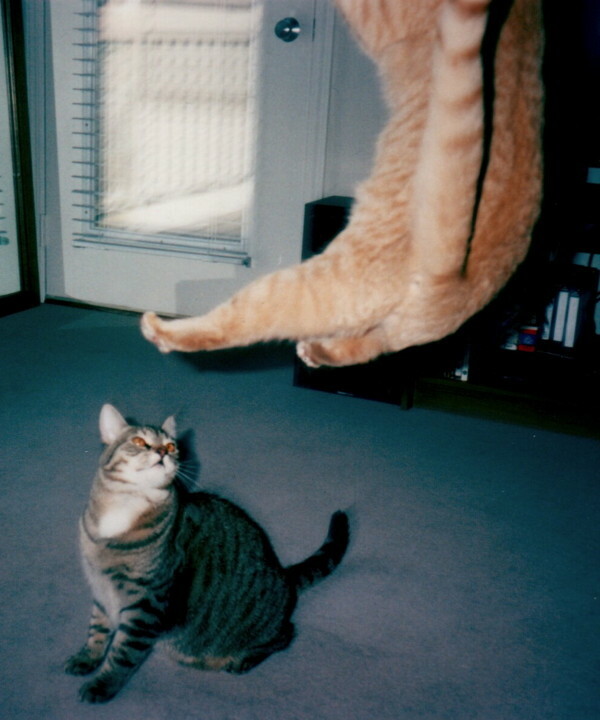 Newton would often roll onto his back to fight, which was funny since Blackjack was much bigger than he was. Newton had some weird habits. One was jumping up on my desk when I was at it and putting his head directly under the incandescent bulb of my desk lamp, “baking his brain” I called it. He never showed signed of getting particularly cold, so I don’t know what was going through his head. He was also the cat who would spaz out at a second’s notice and go running through the house. At the townhouse he’s tear down the stairs to the landing halfway, and then wriggle under the railing to jump down to the floor directly, and then keep going. He’s also the reason I didn’t have house plants for many years, not because he’d eat them but because he’d dig in the dirt in the pot. Again, don’t know what was going through his head. For a few years he liked to lie in the sink; when he got older, he just liked to drink out of it. And he liked to bury his head in my armpit, sometimes making snorting sounds when doing so. It grossed Debbi out. 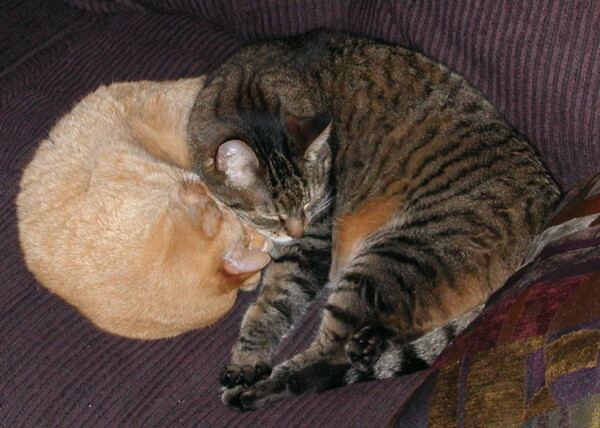 When Jefferson passed away, the cat dynamics changed again; I think Roulette sort of inherited the top cat position from Jefferson, because neither Newton nor Blackjack was willing to yield it to the other. We moved to our current house, and Newton again was the first cat out of the carrier to check things out. 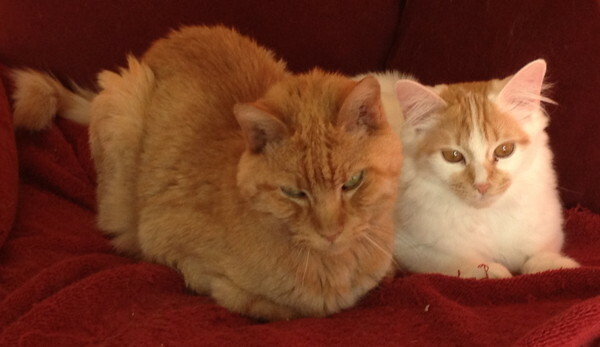 Blackjack was diagnosed with lymphoma in early 2011, but by this time Newton was almost 17 years old and was taking medication for hyperthyroidism, so I think their struggle ended without really being resolved. Then early last year Newton spent a few days in the hospital, and was diagnosed as having slowly-failing kidneys (kidney failure seems to be a common way older cats die). When he came home he was not quite the same cat he was before, having slowed down a lot and lost a lot of weight. He spent more time downstairs, taking the center spot in the family room couch as his own, and didn’t sleep with us anymore. He went on a regimen of subcutaneous fluids and various drugs, which took a while to figure out how best to give them to him (especially the aluminum hydroxide; going with an oral syringe of it in gel form worked much better than adding a powder to wet cat food). 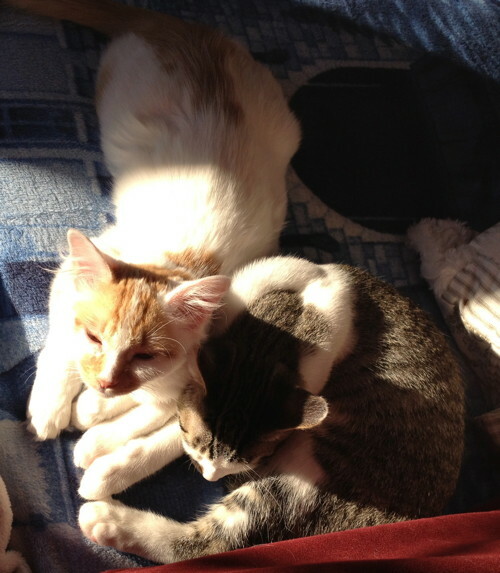 Last November we got our new kittens, Jackson and Sadie, and Blackjack passed away a couple of weeks later. 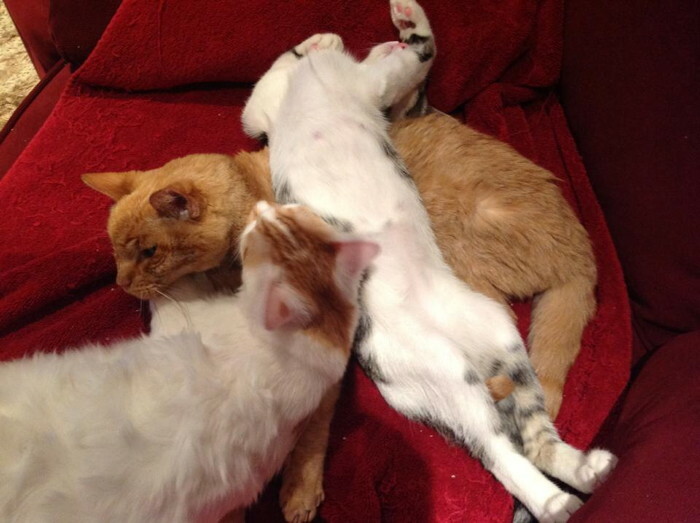 Newton quickly laid down the law with the kittens, showing that he wouldn’t take any guff from them, but they could sleep with him if they wanted. I think they actually made him perk up a bit because there were now things going on in the house. We realized earlier this year that Newton couldn’t really run and could barely jump anymore, which meant it was now safe to let him out into the back yard with minimal supervision. This quickly became his favorite thing in the world, and he would sit at the back door meowing to go out, and also try to slip out with a human when the door opened. As long as he didn’t go under the deck, we let him have the run of the yard. He’d lie in the grass, sit on an edging stone, walk behind the Japanese maple, and then come over the rub his head against me, in thanks, I guess. He didn’t make his last months easy, though. He stopped peeing inside his litter box, so we put puppy pads down in strategic spots for him to use. Sometimes he’d miss and we’d have to clean up the floor. These last couple of weeks he started peeing in other places (even on the blankets on the couch a few times, though we managed to save the couch from getting wet), and he was meowing more and more. 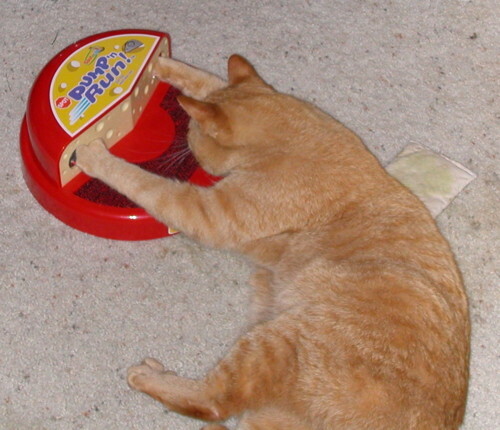 Sometimes he’d put his head down, and then three minutes later lift it up and meow for thirty seconds. I don’t know whether he was sleeping very well, or eating or drinking. And his breath got really foul, which our vet says can be a symptom of severe kidney degradation. So I made a vet appointment for today. I took him outside for one last walk around (the picture below is from this morning), and then in we went. After talking with our vet and thinking it over for a while, I decided that it was probably time. His meows probably meant he wasn’t very comfortable anymore, and I didn’t want him to deteriorate over the next week or two to the point where he was miserable and pathetic. The vet thought it was a good decision, that even if we treated his current symptoms it was likely he’d only have a few more weeks. I didn’t know going in whether that would be the decision, but I thought it was likely. Despite feeling like I’d said my goodbyes to him last year before his hospital stay, and the fact that he hasn’t really been the same cat since, it was still very hard to say goodbye. We snuggled with him until he was sedated and he seemed just happy to be in our arms. Several of my friends had young cats around the time I got my guys, and Newton I believe outlived all of them: Scout & Smokey (Newton & Jefferson’s doppelgangers), Sarabi & Mufasa (Sarabi passed away earlier this year), Oscar & Spud. And all the “K” kitties two of my friends had, of which I only remember Kang, because he always wanted to snuggle with me when I visited. Goodbye, little orange fellow. You had a long, full life, and I’ll miss you. 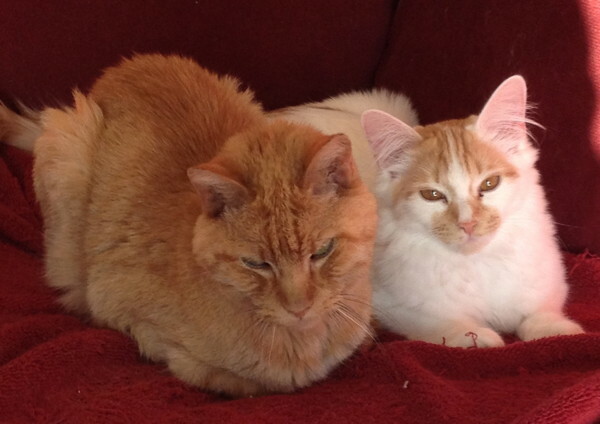 When I got Newton and Jefferson in October 1994, my vet’s best guess was that they were about 6 months old, so they have an unofficial birthday of April 1, 1994. Seeing Jackson and Sadie grow up (they’re about 8 months old now), I’m pretty sure my guys were actually younger than that, but I’ll never know for sure. In any event, Newton is now approximately 19 years old, which is something like 94 in human years. He’s an elderly kitty. Since his hospital stay last year, he’s been doing pretty well, but he’s been getting harder to care for. This is less expensive than it might seem – only the Epogen is really expensive – but it’s a lot of stuff we have to do every day. This (combined with Blackjack’s condition prior to his death last year) is the main reason we haven’t taken a vacation trip since our two weeks in Hawaii in 2011. It’s been a drag in that regard. On top of that, Newton has basically stopped using his litter to pee in, so we’ve had to surround the downstairs litter with puppy pads for him to go on, and change them once or twice a day. Some days he doesn’t even make it to the litter and just goes on the floor. It’s pretty annoying. I’d be more okay with giving him all his meds if he just used his litter properly again. The one bright spot is that he’s still doing pretty well. We upped some of his meds to the levels above when he went to the vet in February. But the vet said that he seems basically healthy, and still happy (since he was rubbing his chin on things in the vet’s office). He has his days when he does little besides sleep, but other days he walks around a bit, sits in the sun, and meows at nothing. And he loves for me to take him outside into the back yard; since he can’t jump well anymore, I let him walk around in the grass on occasion since I know he’s not going to run away (over our 7-foot-tall fence). Newton’s not really the same kitty he used to be, and he keeps to himself a lot. While I’m glad he’s still around, part of me kind of wishes that his decline wouldn’t drag out quite so long. And that he wouldn’t pee on the floor. Anyway, we’re going to have to take a vacation sooner or later, and the care he needs means we can’t really ask our friends to come watch him, so we’ll probably have to find and pay for a professional sitter. I haven’t written here in over a month – just haven’t been in the mood, I guess. Also, not a huge amount going on in the month of February. March has been a bit different: Debbi’s been back east for the last week and a half visiting her parents (with a side-trip to Disney World yesterday and today), so I’ve been on my own at home for the first time since her sabbatical in 2011. It was pretty lonely for the first couple of days, trying to figure out what to do with myself (not that I didn’t have plenty to do). After the first weekend it got a bit easier. I hosted Magic last Monday, went to Dana Street for comic book night on Wednesday, and hosted a poker night on Friday. The poker night had a notable hand: In the big blind I got dealt… well, it came around to me with a single raise and I said, “I don’t have any cards.” I’d been distracted and hadn’t grabbed them from the middle, and they were sitting mixed up in the muck. Without my saying anything, people agreed I could just take the top two cards off the deck (no, I wasn’t the dealer) and play them. So I got two cards, and they were… the Ace-King of diamonds. I called the raise and saw a flop of… three diamonds, for the nut flush. The small blind bet into me, and I called, and everyone else folded. The turn and river bricked, and I got it all in on the river. My opponent thought a while and called, then mucked to my flush. He said he had a set, which was the only hand that made sense to me, other than a lower flush. He said my call on the flop confused him into thinking I didn’t have the flush, which was more-or-less what I’d intended. It was a little funny since he slowplayed several big hands that evening. I wonder what the two cards I didn’t get to play were? I signed up to watch some friends’ cats this past weekend, and kept plenty busy besides, reading for our book discussion on Sunday, cooking meals, and running errands. As usual I didn’t get half as much done as I’d intended. I also took Newton and Roulette in for their annual check-ups on Saturday. 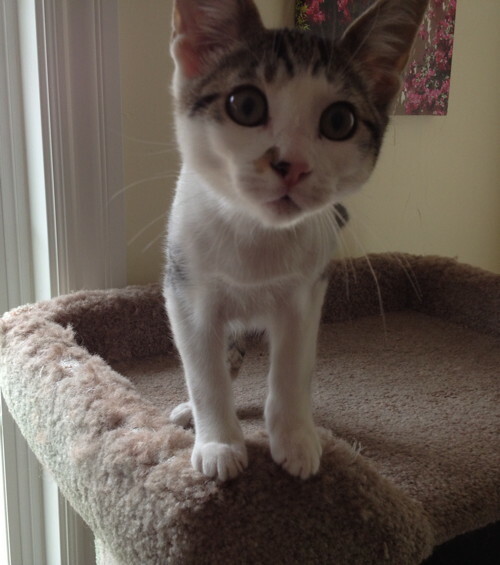 Newton’s down to just 4-1/2 pounds or so, but the vet says he seems happy and fairly healthy otherwise. We’re giving him more subcutaneous fluids but otherwise keeping things about the same unless things change. I’m glad he’s happy. He’ll turn 19 next month, which is just mind-blowing. The kittens are doing well. They sleep with me every night and usually snuggle with me in the morning. I think Roulette is very gradually coming to accept them, but it’ll probably be months yet before they snooze together. 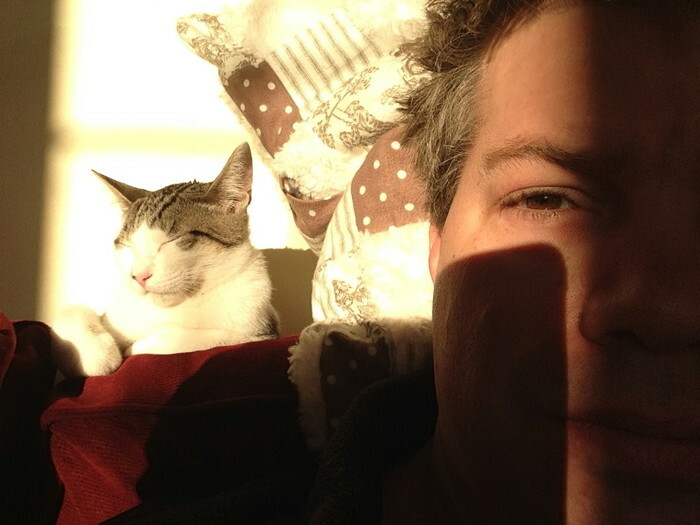 All the cats were happy that it was so warm this weekend that I opened up the windows until sundown. Today, alas, I’ve come down with something, so I had to bail on hosting Magic tonight and I’m sitting quietly on the couch (having eaten too much hamburger and tater tots for dinner). Debbi’s back tomorrow, and then things will be back to normal for a while. It’ll be nice. The kittens have had the run of the house for about a month and a half now, and things seem to be going well. There are some expected bumps, though. Jackson is turning out to be the troublemaker. He’s gone behind the A/V cabinet and chewed on some of the thinner cables, breaking both the AM and FM antennae for my receiver. (It turns out those are hard to replace – no one really carries replacements!) We’ve piled empty boxes back there, but he keeps trying to get back there anyway. Then we grab him and put him in time out (holding him against his will) and he mews pitifully. He tries to force his way into our food at meal time, and yesterday stood on a spoon covered in pesto sauce while licking a plate. He likes to “help” me scoop the litter, standing in the box and batting at the scoop. Sadie is not quite as rambunctious, and has gotten snugglier as she’s grown up. She likes getting attention in the middle of the night, which is not ideal, but she also likes to check out what people are doing. Sometimes I’ll be in the study and she’ll walk in meowing, and I think she just wanted to know where I am and make sure I’m okay. One morning she climbed through the shade in the front window to watch me leave for work. 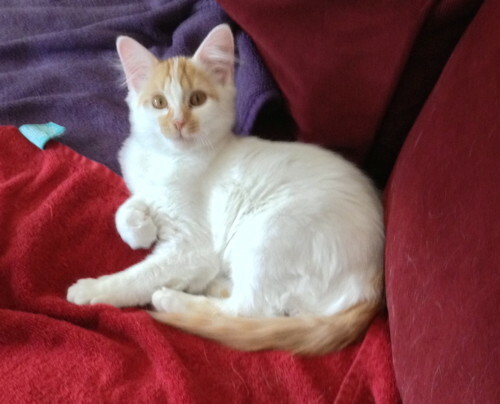 Sadie is turning out to be a medium-long haired cat, which I would not have guessed from when she was a kitten. I’ll need to get her used to getting brushed. Jackson is definitely short-haired, and his fur is starting to soften a little. Jackson is going to be long and lanky, as I think I’ve said before, while Sadie will have a more compact body. 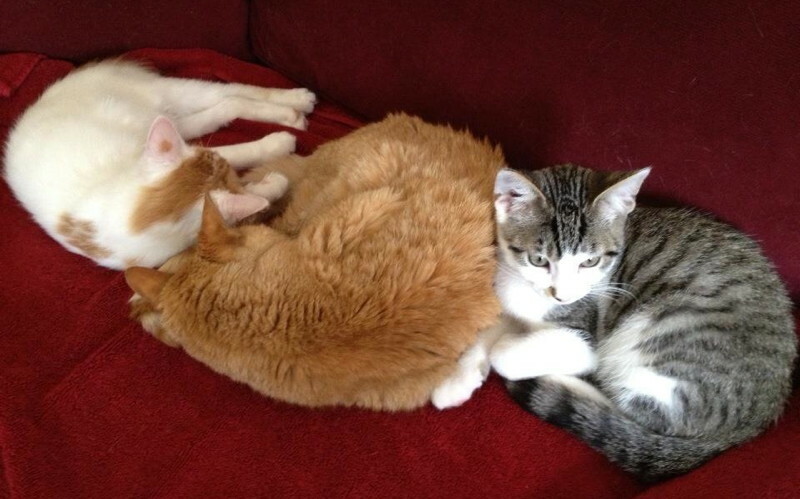 The kittens get along very well with Newton, and often sleep with him. I think Newton enjoys the attention, and I wonder if he was a little bored, lonely, or even feeling a little abandoned before the kittens, since he now spends time with them in group grooming sessions and seems a little perkier and happier (now that Sadie isn’t pouncing on him). I know he doesn’t like all the medicines and subcutaneous fluids he has to take, so the more innocent attention the kittens give him might make him happy. He’s also taught them about drinking out of the sink in the downstairs bathroom. Getting along with Roulette is taking longer. There’s still some hissing, and Sadie sometimes chases her, which we can’t really tell whether she enjoys or not. Maybe sometimes she does and sometimes she doesn’t. Sadie really wants to be like Rou, and we often see her imitating the big cat. They don’t quite sleep together in the sun on the guest bed, but close. Jackson has tried to win her over by being snuggly like he was with Newton, but so far it hasn’t worked. But at least Roulette isn’t hiding under the bed all the time, and Debbi even saw her and Jackson playing next to each other in some brown packing paper we’d put on the floor. They’ve also been doing very well with guests: We had Chad & Camille and their kids over last weekend and the kittens were quite sociable. Today we had Subrata & Susan and their son over for part of the Super Bowl and they again were quite happy to check out everything everyone was doing. It’s nice not to have either cat running and hiding when people come over. 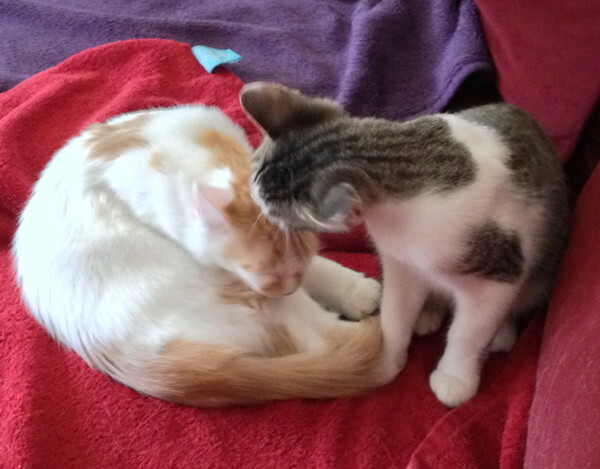 Yesterday we took the kittens to the vet for their last round of shots. When we were there a little over a month ago, Sadie was around 4 lbs and Jackson was a bit over 3 lbs. Jackson has passed Sadie and is now at 7 lbs, while Sadie is a little over 6 lbs. The vet thinks Jackson will be a 14-15 lb kitty, while Sadie will be 10-11. That’s gonna be a lot of Jackson to deal with! Frankly my feeling about 2012 is that it shouldn’t let the door hit it on the way out. The year started quietly enough, but in March Newton spent several days in the hospital. I honestly didn’t think he was going to make it when we brought him in, but he pulled through and is still with us today. It made for a really rough month, though. Sadly, Blackjack wasn’t so lucky, as he passed away last month 20 months after being diagnosed with lymphoma. We don’t have any regrets about making the decision, but it made for an un-merry holiday season. The second half of the year was dominated by my Mom’s affairs, which has been very stressful for me – and rather expensive, with three trips back east. In July I flew back to help take care of her while she was rehabbing from knee replacement surgery. This trip seemed like a big disruption at the time, but in hindsight – in contrast to what followed – I remember it as practically a vacation (albeit one where I was working remotely every workday): I had dinners with friends and with my Dad, and went down to visit Debbi’s family at their beach house three times. And Mom’s cat Maggie and I bonded in the evenings. But this was just the beginning, as soon after I returned we decided that Mom would be moving into an assisted living home. This led to a second trip in August to take over managing her financial affairs. And another trip in October where my sister and I worked on going through her physical stuff. My uncle (who’s done this for family members himself) did give me some good advice, though, that many of the things I had to do are straightforward so long as you attend to them and don’t let them languish, and frankly he’s been right. As much as I’ve disliked having to do many of these things, I haven’t really run into any real problems in getting them done. The whole year wasn’t bad. Debbi’s parents visited us in February, and my Dad came to visit in April. I got to see a lot of Dad this year with my trips back east; as I said at the end of the August trip, it was good to see him and Mom (and Debbi’s family), but the rest of the trip sucked. And in November we expanded our furry family with the addition of Jackson and Sadie, who have been a handful but have also been a nice distraction from some of the other things going on. So I dearly hope that 2013 will be a better year, with less stress and less sadness. I still have some worries about things I have to take care of, and I think I’m just going to be worried about Newton’s health from here on out (he will, after all turn 19 in April). My hope for this year is that the tasks I have to accomplish for my family go smoothly, and that Debbi and I can take a few vacations. That and healthy kitties is all I really ask from this new year. The kittens have been a nice distraction from Blackjack’s passing. They’re getting big so quickly! A about two weeks ago we started letting them out of their room to start exploring. First we let them have half the upstairs hallway and a bathroom, then the whole upstairs (guarded by a baby gate and a human sitting at it at the top of the stairs). They loved chasing each other back and forth through the hall and bedrooms, and they explored the bathrooms, and the beds, and various other things. A melancholy moment was when Sadie went to the laundry basket where she’d encountered Blackjack before, and we’re pretty sure she remembered him and was looking for him, as he was the first kitty she’d really met. I like to think Sadie and Blackjack would have become friends, had things gone differently. Last weekend we opened up the whole house to them (except for the study and the laundry room). They careened down the stairs and suffered a major traction loss when they got to the hardwood floors downstairs, but since then they’ve loved it! Jackson likes hanging out under the Christmas tree (and we have to stop him from chewing on it), and they both like to scale the cat tree. I think it took the better part of the two days last weekend for them to finally calm down enough to sit and snooze with us. At times we’d see Sadie walking around looking absolutely exhausted, but she was still so excited that she didn’t want to sleep because she might miss something! But eventually they napped: Sadie sleeps loafed up on a couch cushion, while Jackson sleeps on his side with his legs sticking out. And then they wake up and do it all over again. We still put them in their room overnight or when we’re leaving the house (and sometimes just to give the big cats a break from them), but they’re totally looking forward to being out all the time. And we’re being really careful when we go outside when they’re out to make sure they don’t try to dart outside. The big cats are doing okay with them. There’s been some hissing. Jackson seems to back off when hissed at, he doesn’t want to get smacked down. Sadie, though, runs after Roulette and paws at her even when hissed at; I think those two are going to have to throw down at some point. If Roulette would just smack her a couple of times that might resolve things, but so far she hasn’t. Sadie has even tackled Newton on the couch a couple of times! Roulette ran upstairs the first few times we let them out, but now she stays downstairs and is usually either under the futon, or on the back of the couch, watching them. 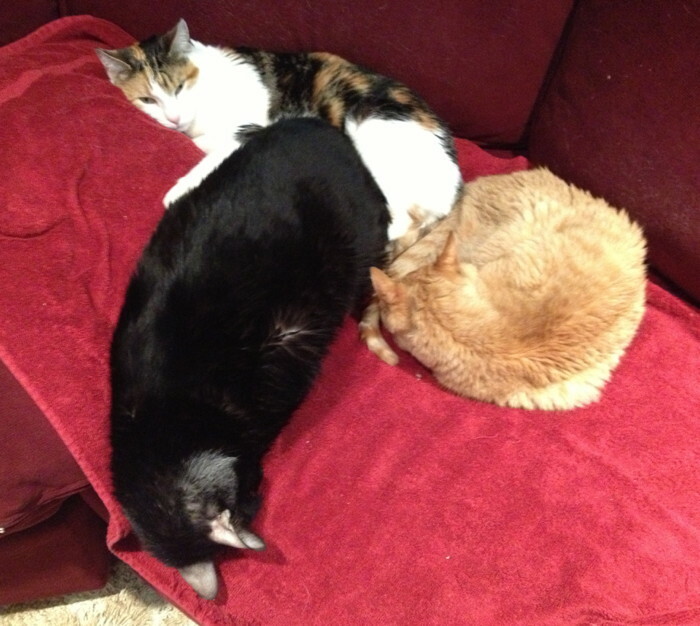 Newton followed them around a little, but now isn’t very interested unless they disturb his sleep. Jackson likes to go sleep with him sometimes, and he gives Newton a bath when he does (Newton has mostly stopped grooming himself in his old age). One time I heard Newton meow, and I went over to find him ready to jump off the couch, while Sadie was upside-down, on her head, back to the couch cushion looking at him. “Extreme kitten flirting” I called it. Debbi’s started giving all four cats wet cat food together as a treat, and they’re all pretty accommodating. Jackson is a bit of a bully trying to get the others cats’ food, and Roulette is torn between wet food (her favoritest thing) and staying away from the kittens – the food wins. To her credit, she’s also played with Debbi and the kittens when Debbi brings out a toy, so she’s starting to get used to them. The kittens’ personalities are slowly emerging. Jackson is full of energy, is easily distracted, but is also the snuggler when he finally winds down. He’s also got the extra-loud purr. Sadie paces herself a little better, isn’t quite as aggressive, but also interacts with the humans less. I think she’s still trying to figure out how to get people to love her. I hope she becomes more snuggly because she has extra-soft fur which is great to pet. 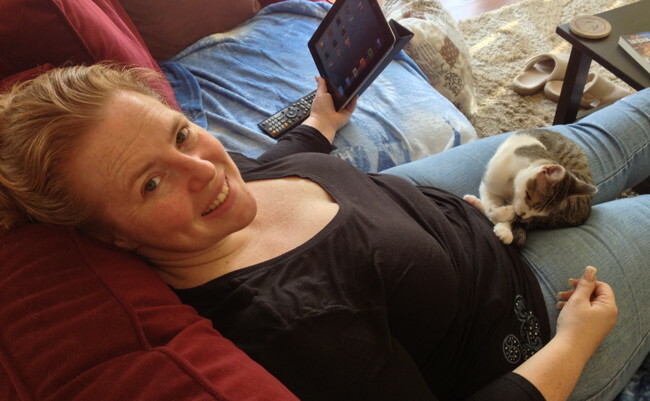 The kittens have been a lot of work, but they’re also a lot of fun. They keep themselves entertained a lot, and then crash and hang out with us for a while. The big cats are still not too happy about it all, but I think they’re slowly coming around. I wrote about the kittens, so I also wanted to update how the big cats are doing. I’ll start with the bad news, which is that Blackjack has not been doing well. He’s been gradually going downhill for a while now, but right after Thanksgiving he had a big slide: He doesn’t jump anymore, he seems disoriented and unbalanced, and he spends most of his time sleeping. Debbi took him to the vet this morning and they’re running some tests, and gave him a vitamin shot, so we’ll see. He might have something treatable, or his cancer might finally be catching him. Or, we might never know, since we’ve already decided we’re not going to run invasive tests on him, since anything we find is probably more than we’d be willing to treat at this point. Fortunately, he doesn’t seem to be in pain, and he’s still eating, drinking, and using his litter, and he sometimes comes out to say hi. But it’s been a hard week. Newton, by contrast, has been getting better recently. Well, sort of. He went in for some blood work and had lost a little weight, which surprised me since he feels heavier and more solid to me. His hyperthyroidism has been improving, but his kidney values are off a bit. So we’ve cut back on his thyroid meds, but are giving him subcutaneous fluids an extra day per week. The doctor said we want to treat the symptoms, but we also want to treat him, and he seems to be feeling fine. Really: He’s up and about more often, he’s curious about things (he wants to go into the garage lately), he walks around meowing and demanding that we put water in the sink for him to drink out of, and his appetite is fine. He even chased Roulette off the couch recently, although he doesn’t move so fast anymore so she got away easily. He’s no spring chicken, but at this point I could almost believe he’ll outlive us all. His better condition unfortunately has come with him meowing at 3 am again sometimes, which isn’t so welcome. But oh well. As for Roulette, she’s about the same. She’s been a bit more spastic recently, running around downstairs and playing more often. She’s still very wary of the kittens, but not as much as she was. I don’t know if it’s the kittens, or knowing that something is wrong with Blackjack, or sensing Debbi’s sadness about him, but she has been sleeping with us at night more than she has in a long time. That’s been pretty nice. We were sitting on the couch yesterday and every so often she would get up, walk over my lap once, and then go back to where she was sleeping. I guess she’s just checking on us. I’m just hoping she’ll adjust to the kittens and be a good big sister to them, because I think they’ll have a lot to offer her, though I bet she wouldn’t believe that if we told her! Saturday we took Blackjack and Newton in to the vet. For Newton it was a 3-month blood test, to see how he’s been doing on his range of medications. The outcome was that all his numbers are basically the same as last time, no better no worse, which is good news, I guess. Except that his white blood cell count was elevated, which probably indicates some kind of infection. So he’s on a round of antibiotics (yay, another twice-daily medication to give him) for a week and a half, and then we’ll have him retested. On the bright side, he’s up to 7-1/2 pounds, from a low of 5-1/2 when he was hospitalized. For Blackjack, Debbi wanted him to get a physical since he hasn’t been getting the full work-up at his clinic for his cancer treatments. Our regular vet looked him and said he looks really good. He’s at around 13-1/2 pounds, which is a pretty good weight for him. His Horner’s syndrome receded as quickly as it arrived, and he’s jumping around more than six months ago. So maybe he’ll be with us a while yet. The unfortunate punctuation to this trip is that Newton peed in the carrier on the way home, getting himself all wet. Plus he’s been having problems staying in the litter box when he pees. It’s a vexing problem. I have a couple other ideas of things to try, if our latest trick (puppy training pads) doesn’t work. Unfortunately I wonder whether Newton is reaching the point where he’s living too long. It’s nice having him around, but he’s gradually becoming no-longer-the-same-cat-I’ve-known, and I wonder if he’s really still happy. But he’s still eating, he still prowls around the house at night, and he’s been enjoying the brushing I’ve been giving him recently. So it’s not time yet. No news about Roulette this time around. I think she just slept on the couch the whole time the four of us were gone. I imagine she briefly cackled “The whole house is mi-i-ine!” after we left – and then fell asleep.